Glliter Shoes & Glitter Pumps - Glitter My World! We recommend using polyester glitter for best results. Polyester glitter is waterproof and will do better if your shoes get wet. Poly Flake glitter will also give you the flexibility of using different types of final sealers. However, if you are doing a shoe that will be indoors mostly (like a stage shoe) then Craft Glitter would be fine and perhaps better (bigger flakes = bigger sparkle). Before you begin any glitter project we recommend testing your products together! When you glitter fabric sneakers you want to make sure you use an adhesive that will allow for some stretch and movement. We recommend Tulip. All you have to do is apply the glue to the area you want to glitter, drop the glitter onto the glue, carefully press the glitter down and allow it to dry. Brush off the extra with a soft dry brush. The final step is to hit it with some Krylon Glitter Blast or a waterproof spray sealer (several coats). 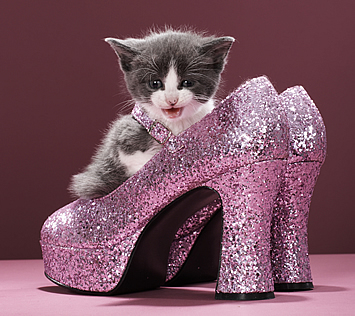 There may be sections of the shoes such as eyelets or edging that you do not want to glitter. You can either be very careful with the glue or tape those part off with blue removable masking tape. 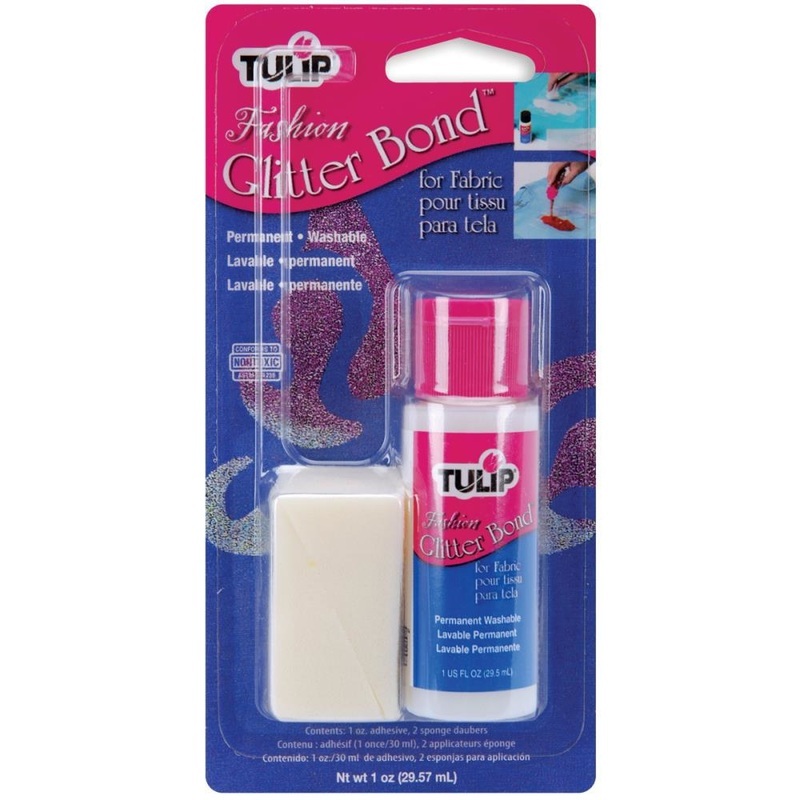 Craft Glitter: If you decided to use this type of glitter do not use the Krylon spray sealer. It can melt the glitter. In this case, wait for the shoes to dry completely and then do an overcoat of Mod Podge to trap the glitter. The following is the glue and pour method for non-fabric shoes. You take Mod Podge and spread it over a section of your shoe. You then take your glitter and pour it over the glued area of the shoe. Press the glitter into the adhesive. Then do another section and another, until you are done. It is best to do this in sections so your glue stays nice and wet. Let the shoe dry completely. The final step is to seal the shoe. Craft Glitter: If you used this type of glitter then you will want to use a water-based sealer or Mod Podge and brush a coat over the top of the glitter. Polyester Glitter: You can hit the shoe with multiple coats of Krylon Glitter Blast or a waterproof spray sealer. You can brush a coat of Mod Podge over the glitter. Let dry and it's party time! This method takes a bit longer, but will keep the glitter flat against the shoe without much texture. You take Mod Podge and mix your glitter into it. Add enough glitter so the mixture is not chunky, but still has a lot of glitter in it. Spread the mixture onto the shoe with a brush or sponge brush. Keep the coat as even as you can. Continue to coat the shoes (allowing them to dry between coats) until you achieve the glitter look you desire. Allow them to dry and then do one final coat of Mod Podge to seal the shoes. Note: With this method you will lose a bit of the natural sparkle of the glitter. This happens when you overcoat glitter with glue. You have no doubt been told that you cannot glitter plastic or high gloss shoes. Not true! The thing about the high gloss surface is that most glues will peel off eventually. When working with glossy surfaces you have to pull out the industrial 3M Super 77 Spray Glue. This is the brand that works, and really only this brand. The Design Master, Krylon or bargain brands will not work. They are too wimpy when up against the glossy surface. You can find 3M Super 77 at our website or at hardware/craft stores. 3M markets the same glue to guys in a brownish can (hardware stores) and a red and purple can to gals (craft stores). Same glue, so buy it wherever you can find it. When using a spray glue you want to mask and tape off everything that you don't want glue on. You also want to do this outside with good ventilation. The can will tell you to wait a bit for it to get tacky. We recommend one heavy coat and immediately getting the glitter onto the glue. Do not wait! Press the glitter down and really work it into the glue. Brush off any excess glitter. Let the shoe dry about 15 minutes and then seal it. Craft Glitter: Seal with Mod Podge or other water based sealer. If you use a spray sealer your glitter will melt and discolor. Poly Flake Glitter: Seal with Mod Podge, Krylon Glitter Blast sealer or whatever your favorite sealer is.